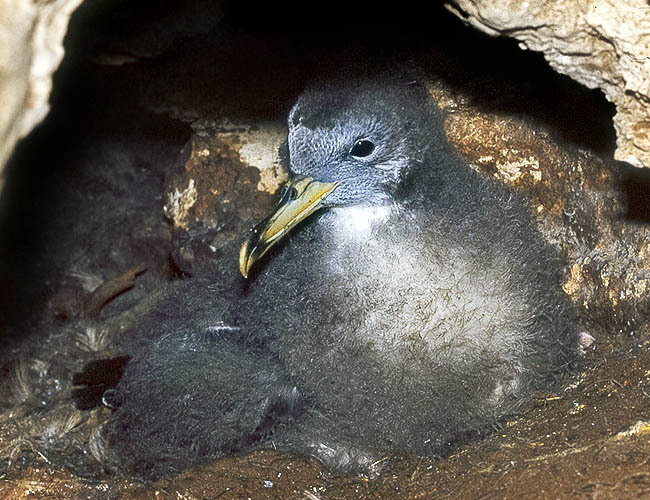 The Cory’s shearwater (Calonectris diomedea Scopoli, 1769) is a bird belonging to the subclass of the (Neornithes), to the order of the Procellariiforms (Procellariiformes), and to the family of the Procellariids (Procellariidae). The members of this group are pelagic birds presenting many physio-morphological affinities with the Albatrosses (family Diomedeidae). They have long and pointed wings, short tails and robust bills covered by distinct horny plates and equipped with two coupled nasal small tubes. Highly skilled fliers and swimmers, they spend most of their life at sea. Typically pelagic species, with reproductive range limited to the Mediterranean, apart only one reproductive location, composed by few pairs, recently found on the French Atlantic coast in the Arcachon Bay. The Mediterranean population is estimated in 142.478-222.886 pairs, mostly distributed in the central sector (Tunisia 113.720-176.750; Maltese Islands 4100; Croatia 1000-1500; France 1044-1293; Italy 13.344-21.873), secondly in the eastern one (Greece 5200-8300; Turkey 0-200) and western (Algeria 1070; Spain 3000-8000). In Italy it is common in the Sicilian islands, more scarce in Sardinia, in the Tuscan Archipelago, in the Tremiti and Pontian islands. A recent revision concerning the distribution of the colonies shows 60 occupied reproductive sites, all on islands of various sizes, but two on the Sardinian coasts. The most consistent colonies are located in Sicily at Linosa (10.000 pairs) and at Pantelleria (500-5000 pairs), in Sardinia on the coast of Capo Caccia (300-1600 pairs) and in the Toro Island (500-1000 pairs); in the Tuscan Archipelago there are 100-1000 estimated pairs, 300-400 in the Tremiti Islands and 220-345 in the Pontian Islands. The populations, numerically fluctuating or decreasing, are menaced by the ever increasing coastal anthropization, by the light pollution close to the colonies, by the predators introduced by the man (especially, the Black rat – Rattus rattus), by the presence of substantial colonies of Yellow-legged gull (Larus michahellis) in the reproductive sites, by the contamination of chlorinated hydrocarbons and by heavy metals, by the mortality caused by fishing nets and longlines in the alimentation areas and by the taking of eggs and pullets by the man. Typically pelagic, it prefers to nest on small offshore islands, where it settles on rocky coasts (reefs, cliffs, volcanic stony grounds) having ravines, caves and crevices, at times even at some hundred metres far from the sea. Locally, it occupies other animals abandoned dens. The Cory’s shearwater is a migrating species; between mid October-mid November, through Gibraltar Strait, it abandons almost totally the Mediterranean in order to hibernate mainly in eastern Atlantic, between Mauritania and South Africa, secondly along the north-western African coasts and in the western Atlantic off the American coasts. The autumnal passage over Gibraltar towards the Atlantic is estimated to amount to 600.000 individuals. The returning movement takes place in February-March. The hibernation in Mediterranean is very scarce and localized. It has the size of a Yellow-legged gull, but is immediately recognizable during the usual fishing flight, made by few wing beats separated by reiterated glides just above the water with its long wings kept arched downward. It can be 46 cm long, with a wingspan of little more than one metre and a weight varying from 600 to 800 grams. The head is pale greyish, the upper parts are grey-brown, the lower ones are whitish, without dark spots on the belly or axillar; the tail is short and rounded, the bill is pink-yellowish, apart a dark mark close to the apex and the legs are pink. There is no difference between the seasonal and sexual liveries. The vocalizations are quite characteristic (they recall whimpers and cries of newborns) and can be heard by dusk almost exclusively in the reproductive colonies; the females’ voice is hoarser than that of the males. 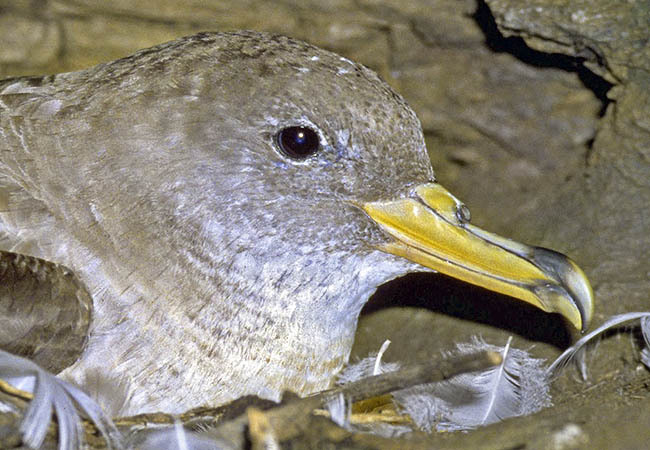 The “singing” of the Cory’s shearwaters has in the past originated imaginative and mythological interpretations: the ancients believed that the shearwaters were the reincarnation of the ancestors, whilst the Greeks identified in their voice the mournful cry of Diomedes warriors died in battle (not surprisingly, the Cory’s shearwaters in the Tremiti Islands are called Diomedeas). Typically pelagic species, it spends most of the time in open seas and gets back to the mainland only for nesting; perfectly adapted to the flight and to the swimming, when on the ground has an awkward and clumsy gait. Strongly gregarious, even out from the period and the reproduction zones, it may form at sea groups of hundreds or thousands of individuals. It eats fishes, cephalopods and crustaceans it seizes in the sea with dips, with dives and underwater and surface pursuits; it has the habit of following the fishing boats which treat the catch while sailing and of frequenting the ports with high density of fishing boats, located even at hundreds of kilometres from the reproductive sites. 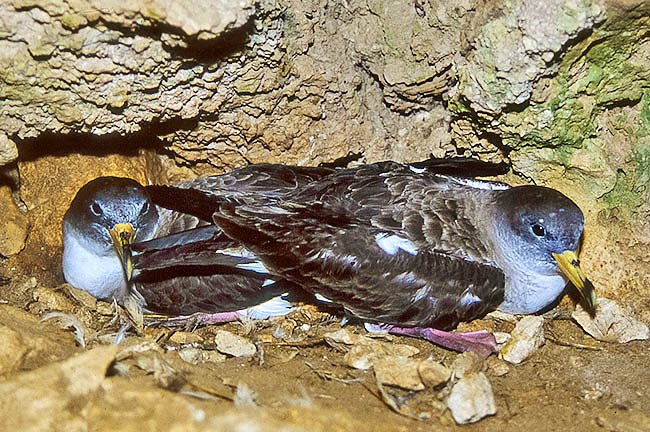 The sea displacements of the Cory’s shearwaters, related with the utilization of the habitat during the incubation and the breeding of the young, have been studied recently by utilizing individuals equipped with GPS-logger; it has been evidenced how the exigency of feeding the young with the due frequency leads the adults to frequent areas closer to the colony, even if, as an average, they are less optimal if compared with the farthest ones used during the incubation, but strategic for the survival of the newborns: the reproducers of Linosa Island have done movements southwards up to the Libyan and Tunisian coasts, the Tremiti Islands ones, during the incubation, have mainly explored the north-western Adriatic, mostly following the Italian coasts up to the Po Delta. Typically monogamous species, it nests in colonies, even quite consistent, as well in scattered pairs. 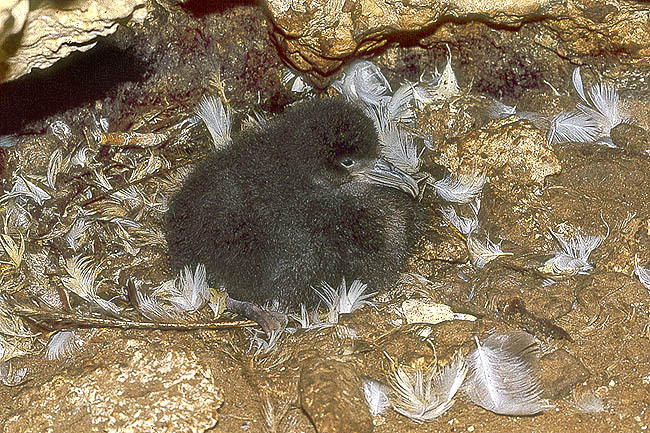 The nest, built on the earthy or rocky substratum using stones, small pieces of wood, bones and feathers, can be occupied again even for many consecutive years: in the Tremiti Islands a pair, recognizable because ringed, gets back to the same nest since 19 years! The spawning of the unique egg, white coloured, happens between mid May and early June, the hatchings take place in July and the fledglings of the young occur between late September and October. The presence of the Black rat (Rattus rattus) in the reproductive sites causes often a very low or zeroed reproductive success. The sexual maturity is reached not before the fifth year of life. It appears that there is a marked correlation between the survival rate and the years of presence or absence of particular climatic oceanic situations, determining a cooling of the sea surface; in particular, the survival seems lower during the years when La Niña determines an increase of the oceanic storms in the Atlantic hibernation zones.